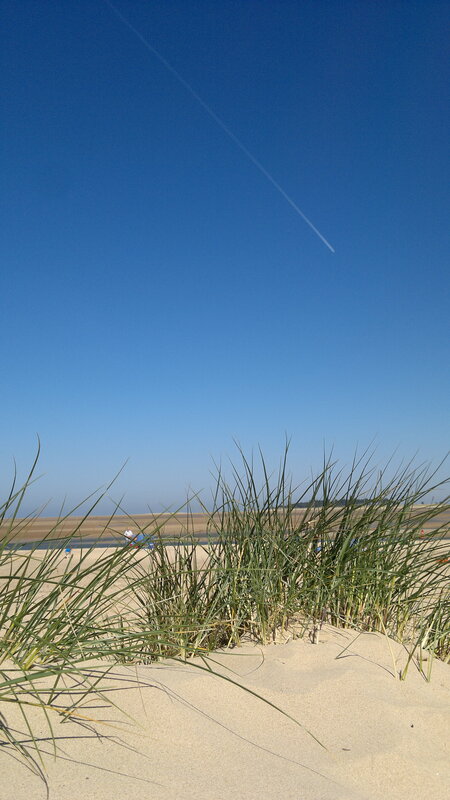 Went to the beach today, a lovely place called Wells-next-the-Sea in North Norfolk. Talk about hot, you could have fried an egg on the sand…well, not that anyone was, but there were plenty of barbecue smells wafting across the beach! I took some happy colourful photos for you to enjoy! 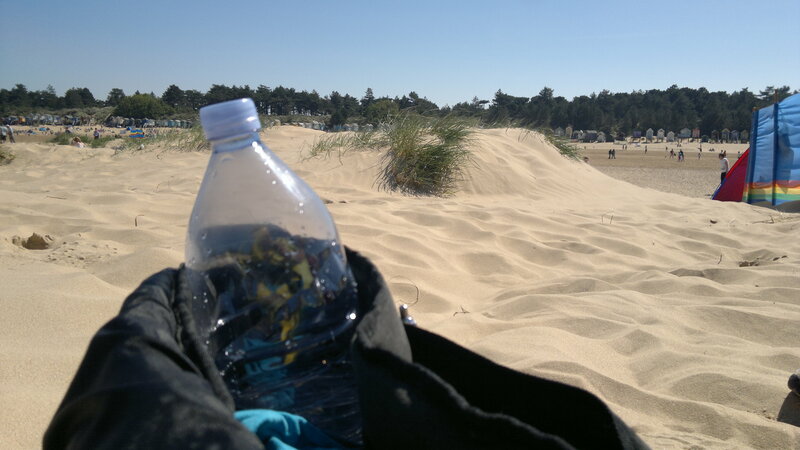 We found a spot out in the centre on a bunch of sand dunes. 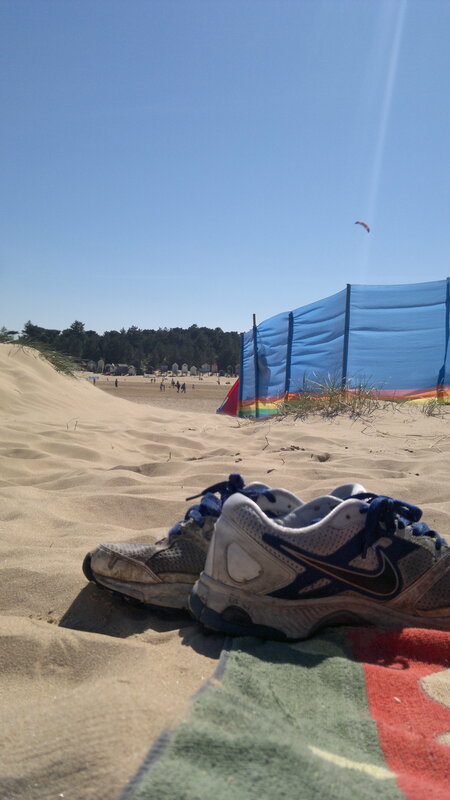 Forgive the scruffy old trainers, they’ve seen better days, but they make walking across the hot sand easier than bare feet! The family behind the wind breaker had a barbecue on the go, we could see the smoke but thankfully we were up wind and couldn’t smell what had to be the mouth-watering burgers! I quite like this photo, mainly because of the contrails from the air-plane high in the sky and the thought of the holiday people on board heading somewhere hot, only to miss out on pretty amazing weather right here in the UK! We never bothered to walk to the actual sea as it was low tide and would have taken a loooong time get there! That bit of blue you can see through the grass isn’t the sea but a strip of water, the sea is beyond the mass of sand and not actually visible from where we were camped out. Beach huts line the edge of the beach, a couple were a little run down but the majority appear to be very well looked after. Brings to mind the golden age of the British beach where men wore those funny striped getups and it was against the law to show more than 4% of your body! Wells-next-the-Sea wasn’t jam-packed with people like some beaches, there were wide open spaces, children playing, dogs dashing about, sand castles being constructed, barbecues sizzling and smoking, laughter, fun, games and good all round happy fun times! What a marvellous way to spend a Sunday afternoon, wouldn’t you agree dear blog reader? A perfect way to spend a Sunday afternoon Dave, and I love your shots; definitely a sign of summer! sand, sun, sea and sky – what a great day. I really like the second photo!